If you are thinking that 2018 is the year that you will jump into the real estate market and purchase a home, there are a few things you should know about getting a mortgage. First of all, interest rates are projected to go up in 2018 so starting your home search sooner rather than later is a good idea. 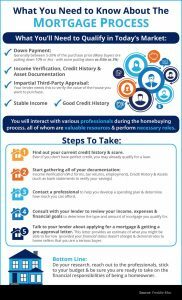 Your first step should be to get pre-approved from a lender. The lender will check income, credit and verify your assets to let you know how much house you can afford. Your lender will educate you on all of the different loan programs available and which will fit your situation best. So, number one….visit your favorite lender and get pre-approved and number two….visit your favorite Realtor and start your home search today! You will be on your way to living in your new home before you know it!